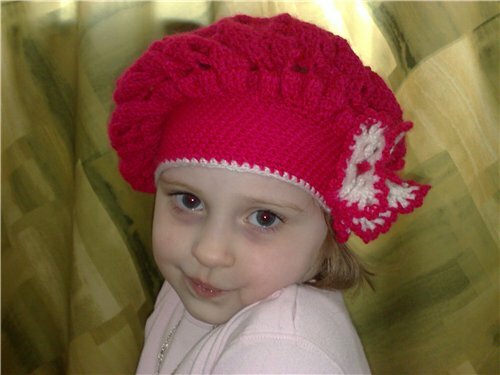 Needlework as a hobby – in itself is great, but when you want to create something for your child, it becomes a real pleasure! Our baby wear is made by your hands is the work of knitting art will be more than pleased, because the thing created by loving mother's hands. Prepare yarn for beret. If you use acrylic, it will fit a crochet hook size 2,5-3. If the thread is more dense – choose hook size 3.5-4. Start to knit a beret with the crown. Collect the thread in the small ring and tie it 6-8 columns without nakida. After you pull the ring by pulling on the opposite end of the thread. 5 a row – in every fourth column, fourth row knit on two columns. In the subsequent rows add less, every fifth, then in every sixth column in the series. Check that the circle has not been narrowed, but not expanded too abruptly, forming a wave. Knit two ways – in a spiral, starting each row again. A method of knitting in a spiral is much easier. Knit circle until then, until it becomes a diameter of about 25 centimeters. Then tie another 3-5антиметров without adding columns evenly. In the following rows evenly and gradually decrease the number of columns in the row, thereby narrowing the product. Take away every fifth column, repeating this for three or more ranks in a row to end the extreme range of the beret to match the volume of the baby's head. Edge of the beret can tie several rows of columns without nakida, or decorative petals. If you decided to tie the child takes a hook to the fall or the spring, sew it to the lining. To do this, not very thick fabric (knit) stitch the lining in the form of a conventional cap, and then vsheyte it in the finished takes. For the colder time of the year, better take a fleece.